The concept of exposure is well-grained in our psyche. We wash our hands after using the loo and cover our mouths while sneezing when sick. We regularly avoid falling sick by reducing our exposure to germs. The same holds true for chemicals. A chemical can be extremely toxic, but you would not be harmed if you are not exposed to it. You would also be safe if you are exposed to it at or below concentrations that do not cause toxicity. When can chemical exposure occur? An organism’s exposure to chemicals can only occur if there is an overlap in space and time. Meaning, organisms must be present at a location where the chemical is found and present at a time the chemical is present in the environment. To understand this, think about Zika virus. Zika virus first showed up in Brazil in 2015. If you were in Brazil before 2015, you would not have been exposed to Zika virus. If you were in Russia (where no Zika virus cases have been reported so far) after 2015, you would not be exposed to Zika virus. In fact, even if you went to Brazil after 2015, there is no guarantee you would have been exposed to Zika virus (after all, not everyone in Brazil is infected with the virus. In 2016, only 206,000 Zika cases were reported. The country’s population then was 208 million). You might not have encountered any mosquitoes or you probably wore long-sleeved clothes or used mosquito repellents to reduce your exposure to mosquitoes that transmitted the virus. How can humans be exposed to chemicals? 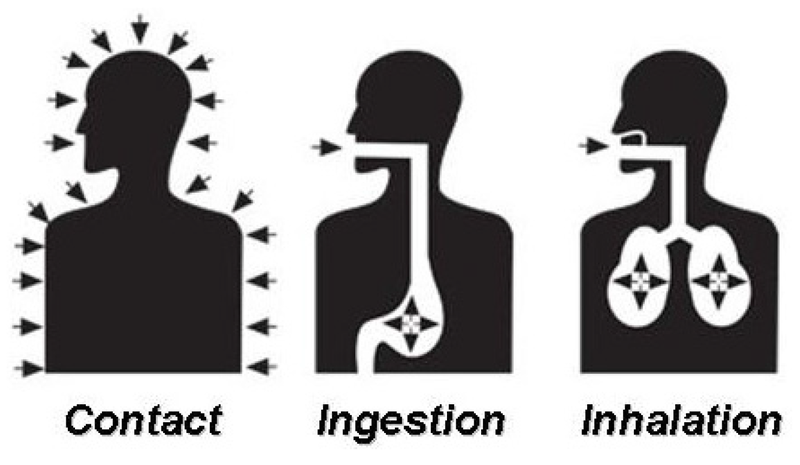 Humans can largely be exposed to environmental chemicals via three routes (see image): contact (skin), ingestion (mouth) and inhalation (nose). The three ways humans can get exposed to environmental pollutants. Image source: Damalas and Koutroubas et al., 2016. The same concentration of chemical can result in different amounts of exposure through the different routes. For example, if a chemical is not very volatile (that is, it doesn’t enter the air easily), your exposure through inhalation is likely going to be low. Also, if a certain concentration of chemical enters your body, it doesn’t mean all that concentration will cause a toxic effect. For example, a chemical can be broken down by an organism’s enzymes before it reaches the site where it causes a toxic effect (chemicals function by binding to certain spots in the cell). Or the organism can release molecules that bind to the chemical, reducing its availability in the body. Thus, the actual exposure that could cause an effect will be much lower. 1. Determine the presence and concentration of chemicals in blood, urine or other tissues in the body. This is done by taking a sample of the fluid or tissue and using instruments to find the presence and /or concentration of the chemical. Different methods and instruments are required to extract and analyze different chemicals. Thus, it usually helpful to know what chemical is likely to be present in an organism before looking for it. And instruments have limits of detection, meaning they can only find chemicals if they are present above a certain concentration. If the chemical concentration is very low, it might be missed. But since such low concentrations typically cause no effects, this is usually not a problem. 2. Computer models can estimate exposure to organisms. These computer or mathematical models are usually validated using real samples. For example, the U.S. Environmental Protection Agency (USEPA) has a model which estimates pesticide exposure to organisms that are outside an agricultural field that has been sprayed with a pesticide. The model was refined using concentration data gathered from air and soil samples outside the field. You can see a list of USEPA exposure models here. The DEEM model is used to estimate how much pesticide humans consume. The model contains data from human consumption surveys (that asked for the type and amount of food consumed) and converts all processed food into its corresponding raw agricultural commodity (i.e., food crops and livestock). This is then compared to the concentrations of pesticides that were measured in these agricultural commodities. One model which I particularly find interesting is the PBPK model. It estimates what skin/mouth/nose exposure is harmful to organisms based on the concentration that causes a toxic effect within the body (the concentration of chemical at the site of action is smaller than the concentration of chemical that enters the body). Also, it can estimate what would be the toxic dose in humans from concentrations that cause toxicity in lab animals. Besides, the Centers for Disease Control and Prevention (CDC) has tracked the presence and concentration of several chemicals in humans. This data is often used to refine models. 3. Tracking chemicals in populations. This has been covered extensively in this post. Previous Can your pet’s pest control product harm you?